We’d love your help. 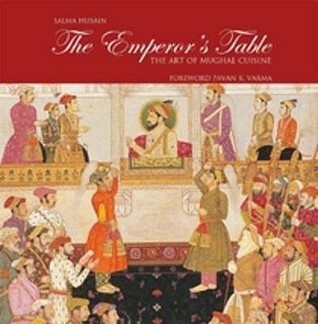 Let us know what’s wrong with this preview of The emperor’s table by Salma Husain. To ask other readers questions about The emperor’s table , please sign up. the book although very highly priced has quite a few facts reGArding the life and times of the great Mughals.it would have been better if a bibliography was given at the end.the recipes enjoyed by various emperos right from BABUR to BAHADUR SHAH ZAFAR look quite authentic but in this kind of book,a little more history from this golden period would have looked great.Also no pictures of any dishes have been provided for the reader which is disappointing. still one must appreciate the time and effor the book although very highly priced has quite a few facts reGArding the life and times of the great Mughals.it would have been better if a bibliography was given at the end.the recipes enjoyed by various emperos right from BABUR to BAHADUR SHAH ZAFAR look quite authentic but in this kind of book,a little more history from this golden period would have looked great.Also no pictures of any dishes have been provided for the reader which is disappointing. This book is just so pretty! It is lavishly illustrated with beautiful Mughal miniature paintings and pictures of exquisite objects from the Mughals' palmiest days of empire. It has pictures and bios of the Mughal Emperors, accompanied by recipes that trigger my drool reflex. I can't wait to try them!